First, there are two ways to cut the pieces from the sheets: with scissors or with an X-Acto knife. Scissors are safer, and X-Acto knife is more accurate. Parents: I would not advise to let your young kids use X-Acto knives because they are so sharp (which is also why they work so well). So, I will list two alternatives for cutting -- scissors and X-Acto knives -- although you can use both if you want. Scissors are sometimes faster. A good pair of scissors: You may already own a good pair of scissors like the ones to the right. These days, there are some very inexpensive scissors that cut precisely that are good for paper modeling. 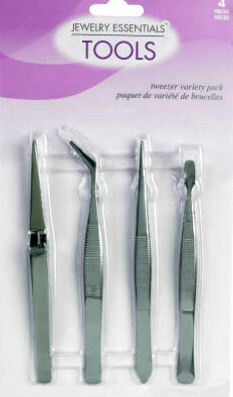 The pair shown to the left can be ordered from Staples (Westcott® Preferred Stainless-Steel Scissors). There are lots of choices which you can get lots of places. I'm sure Staples has something similar to these in their stores. If you decide to use an X-Acto knife, then you will need something on which to cut the paper. An inexpensive, although not perfect surface is a piece of foam core board. The reason it is not perfect is that you can still cut through a foam core board onto the table top. But, perhaps two sheets of foam core glued together would solve that problem. Typically foam core board comes in 20"x30" sheets. Cut the board (carefully) in half along the 30" dimension. After you glue the two half sheets together, you will have a 20"x15" surface on which to cut. Alternatively, I use a Self healing cutting surface: At first I thought this was a luxury but now I think it is essential to give you the freedom to cut without worrying that you will be cutting through to the table on which you are working. I have a green mat that is about 11"x17". 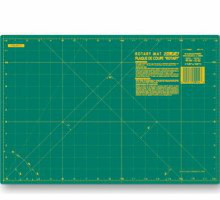 They come in smaller sizes, but since typical sheets you will be cutting are 8 1/2" x 11", it's a good idea to get a cutting surface that is larger than the piece you are cutting. Stainless Steel rulers with cork backing: I have two such rulers -- one 6" and one 12". Since they are steel you can run your knife against them and not cut into your ruler. The cork backing allows you to press down and securely hold the paper you are cutting. Spring clamps: These clamps look like a long alligator snout. Unfortunately I have been unable to find them sold separately; rather they are one tool in sets of five or so metal tools including several different types of tweezers apparently used by jewelers. Scraps of paper and toothpicks to hold glue and to apply glue to small surfaces. Old, dull butter knife for scoring paper: I've tried many tools for this function and settled on stealing a knife from our set of tableware knives. For a long while I was using a hard white plastic scoring tool and found that it wasn't really doing the job of scoring a thin line. Finally I tried out the butter knife with much better results. I'm also thinking of trying a dull wheel pizza cutter. That might work even better than the dull butter knife. Plastic Ziploc bags to collect cut out pieces: Once you start cutting pieces from the sheets of paper, you will collect a lot of small fragments of paper. I find it useful to collect the components of the model in plastic Ziploc bags to make sure I don't throw out the good pieces with the remainders. Elmer's Craft Bond Paper Craft Glue Gel: This is a viscus water-based glue that dries quickly to produce solid joints. Elmer's Rubber Cement: This is a spirit-based glue that you apply to both parts being attached. It has the great benefit that it dries before you affix the two parts and as a result does not need clamping. I use this primarily on situations (like attaching roofs) where I can't apply one of the alligator clamps to the joint. I also tend to cut along all of the lines going in the same direction. This is more efficient although you may have to have a lot of pieces on a sheet in the process of being cut before you finish cutting any one part. Press down hard on your cork backed metal ruler when you run your knife along the edge -- otherwise the paper will slip and your cut won't be straight. For short cuts, I don't use a ruler: I find I can cut a relatively straight line freehand after a little practice. But for long edges, you need to use the cork back ruler as your guide. To get folds to be accurate and crisp, you first need to score the paper using one of the tools described above. 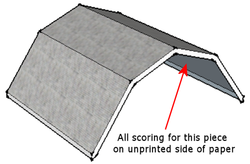 In general you should score the paper on the side of the paper where the fold forms a V.
Sometimes the pieces you need to fold have a very thin edge on one side of the fold -- such as the edges of the roof in the illustration to the right. To help you make a crisp fold after you have scored the paper, place a small metal ruler on the small edge of the scored paper and hold onto the larger portion of the paper as you fold. The heavyweight paper used in these models is pretty tough so don't be afraid to overfold the crease and then bring it back to where you want it to end up. I use a toothpick to apply to the tabs of the paper. I find that a thin coat of gel paper glue applied to the tab followed by clamping the tab to the other side works best. From the time you touch the tab with the glue to the other piece of paper, you have enough time to position the two pieces together so that the joint is precise. Then you put the clamp on the joint. You can still adjust the positioning. Once you are satisfied you have the parts together, it doesn't take long (30-60 seconds) if you have applied a thin coat of glue before you can take off the clamp and proceed. Gel paper glue provides the most solid joints and should be used when it is possible to clamp the joint. Sometimes, however you can't clamp a joint -- for example when attaching a roof to a building. You either have to glue one edge at a time using your fingers to apply pressure to the joint, or you have to use rubber cement. The advantage of rubber cement is that if you use it properly (applying thin coat of rubber cement to both sides of the joint and letting it dry before attaching) you don't have to clamp it. It forms its bond on contact. The disadvantage is that the bonds are not as strong as with gel paper glue. But, rubber cement is a lot easier to use in hard to clamp joints.